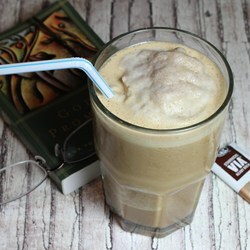 A light frozen coffee drink that is easily adaptable. I have substituted Starbucks® Via™ ready-made for the espresso shots and I sometimes add a handful of chocolate chips to the blender. Blend ice, almond milk, espresso, and honey in a blender until smooth.